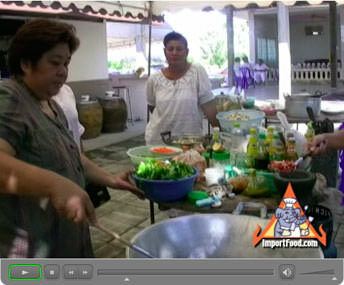 Here is the ideal outdoor gas burner, used by millions of chefs in Thailand and always featured in our Thai street vendor video series. Heat control is a critical element of cooking Thai food properly, as chefs are constantly raising and lowering the cooking temperature. 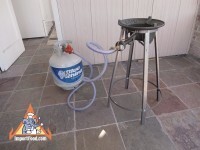 Fully cranked up, this stove will put out about 100,000 BTU, boiling water almost instantly. 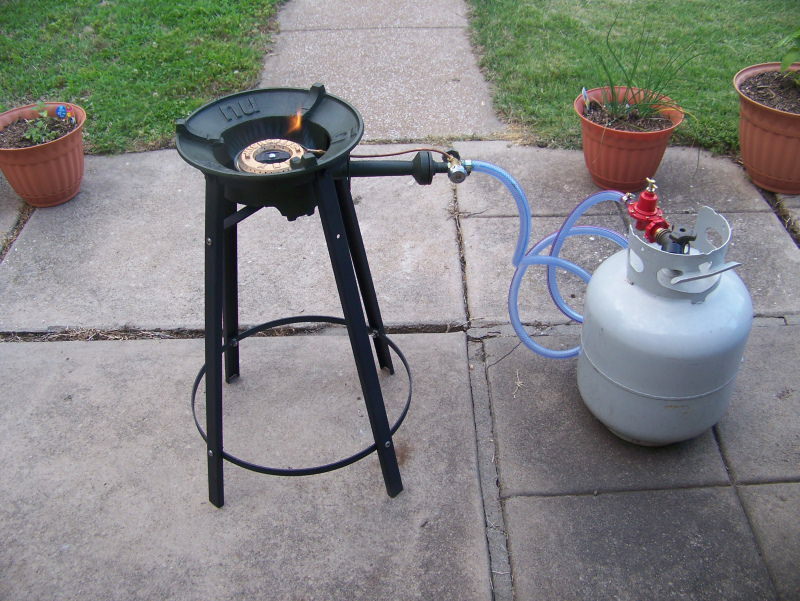 Compare that to a standard home burner which puts out 10,000, or a Wolf commercial range which might put out 20,000. You'll never find a burner this hot. 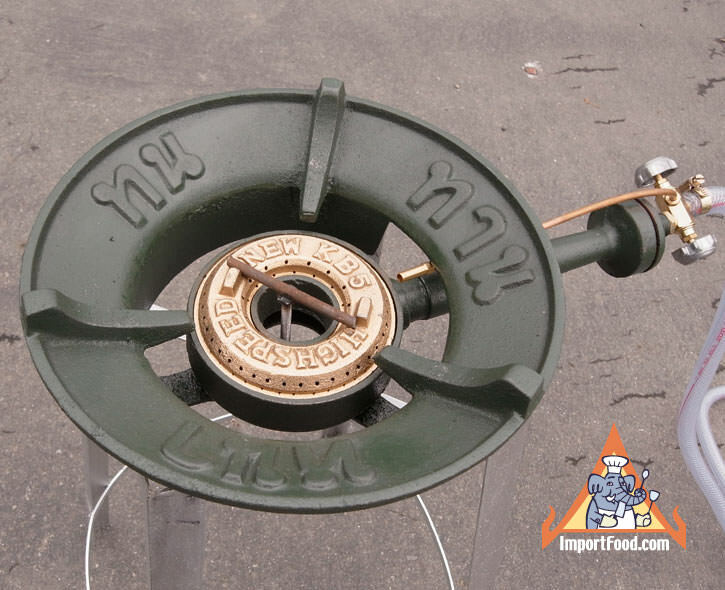 This burner is heavy cast-iron, made in Thailand to the highest quality specifications for years of use. 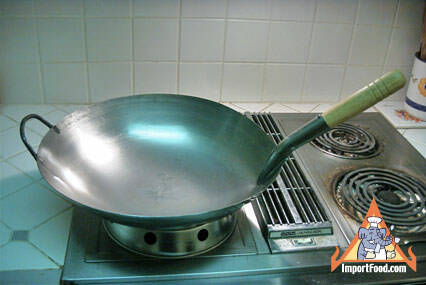 Contoured perfectly for a wok. Far sturdier, versatile, and made with better components than the Chinese-made outdoor cookers found in home improvement stores. 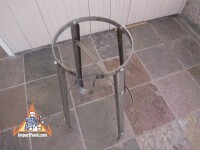 Burner Stand is Made In USA! Support the American worker--see below for more details about the high quality, locally-manufactured stand. The stand is waist high--just right for hours of use. 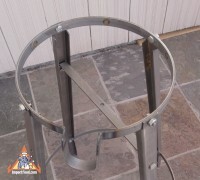 The top, skinny brass tube you see is the pilot light--just use a match to light that, and it stays burning gently like a candle, using minimal fuel. There are three words in Thai language on the burner: Thick, Strong, Forever. With this cooker and some practice, you'll become famous. 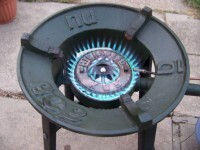 We no longer offer the extremely powerful gas burner, but Please Consider our Tao Burner Instead. 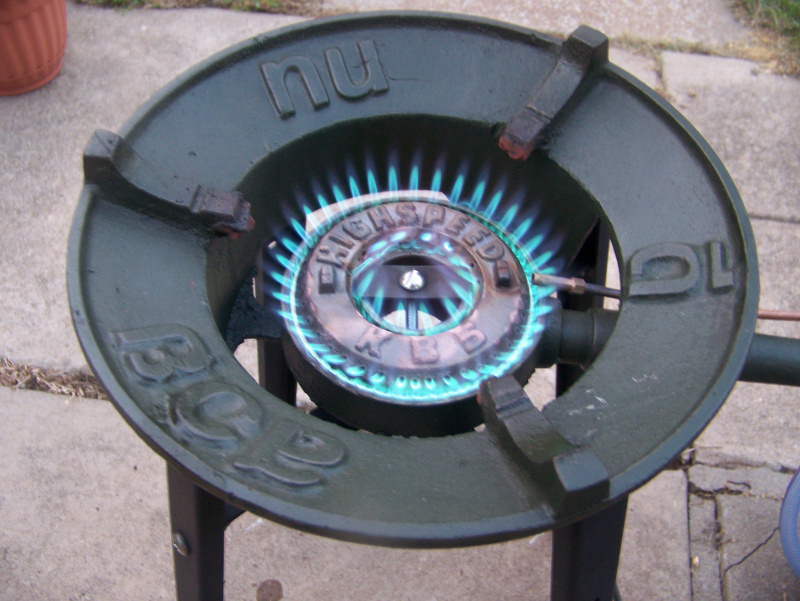 Otherwise, please send us an email () to be notified when if/we have this burner again. Please also consider our existing product line of high quality imported Thai ingredients, and authentic cookware. Our customer Doug from Jenks OK is very happy with the burner, and sent us the following photographs and comments. 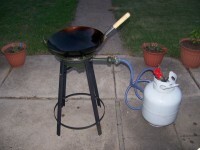 "I thought I'd share a pic of my new 18-inch wok and high-powered propane burner (under there somewhere). 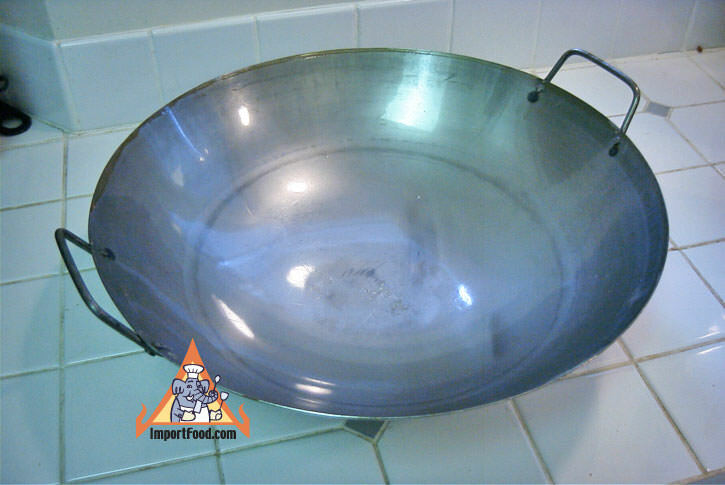 I just seasoned the wok with good results. This rig is going to have ample power and capacity -- Glad I bought it right the first time! 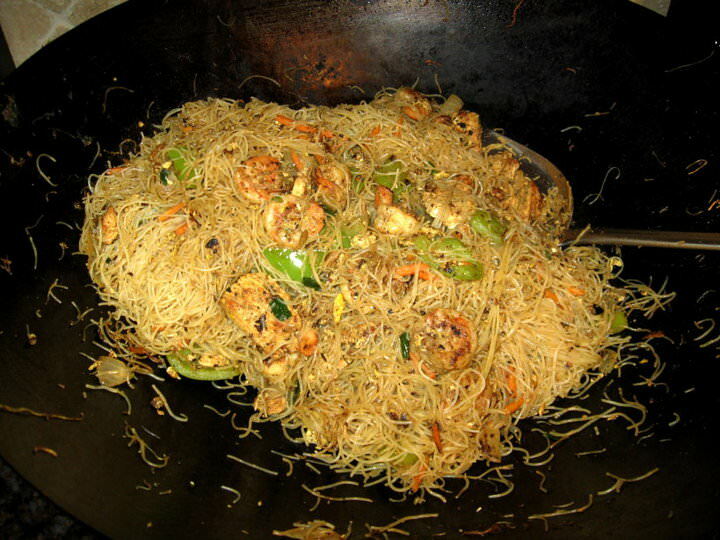 My ImportFood 18 inch wok, 100K BTU burner, and Zebra turner helped me turn out a tasty family-sized batch of Singapore noodles. 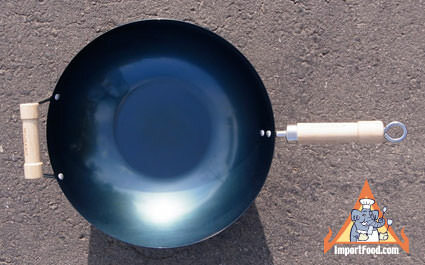 (The wok is developing a nice non-stick surface.)" 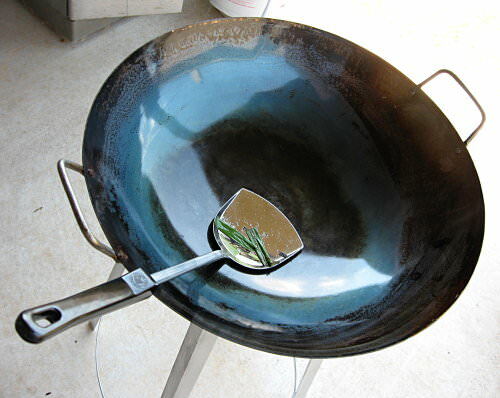 In 2010 we first imported this item from Thailand, and were not impressed with the quality of the stand. Here is a photograph of our old, Thai-manufactured stand. Now we're proud to say that the stand is made by a local company, in Washington State. They helped us improve the design. 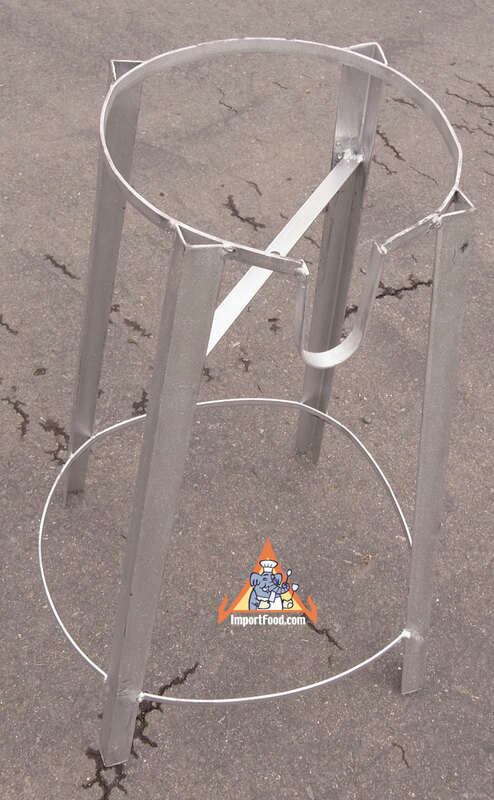 With professional guidance, we came up with a stronger stand using appropriate materials. The Manufacturer has modern precision laser cutting machines used to make airplane parts, tools, truck mounts, etc. The solid, well-built stand just looks American, and we're happy to support the American worker. 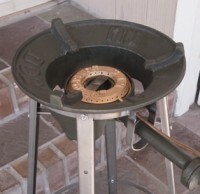 Call this a hybrid cooker--a Thai burner mounted on an American foundation. The stand breaks down easily for storage, or to bring along on camping trips. 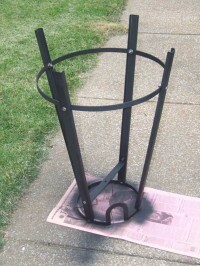 The stand comes unpainted, straight from the machine shop. Some assembly required, everything included. 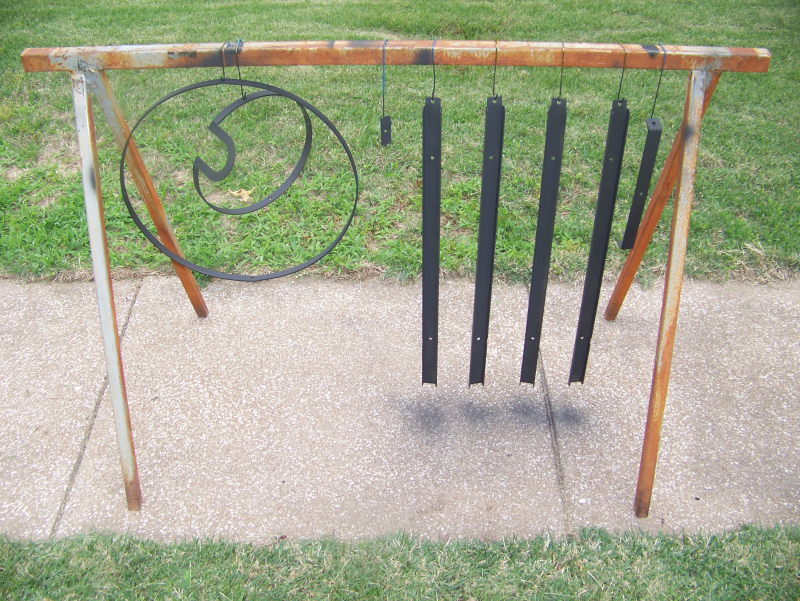 It will rust over time, if you leave it outside. 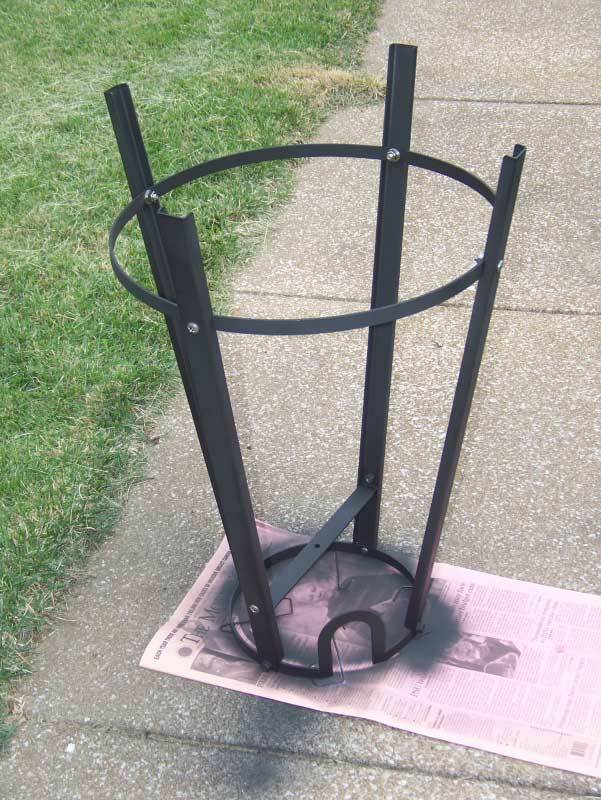 We suggest you consider painting the stand yourself using rust-inhibiting paint, in the color of your choice. 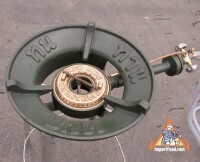 * IMPORTANT SAFETY MESSAGE: This burner is designed for use in Thailand. Use in the United States is at your own risk. 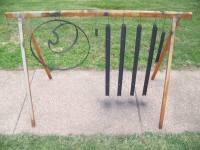 It is not designed for indoor use or commercial use. 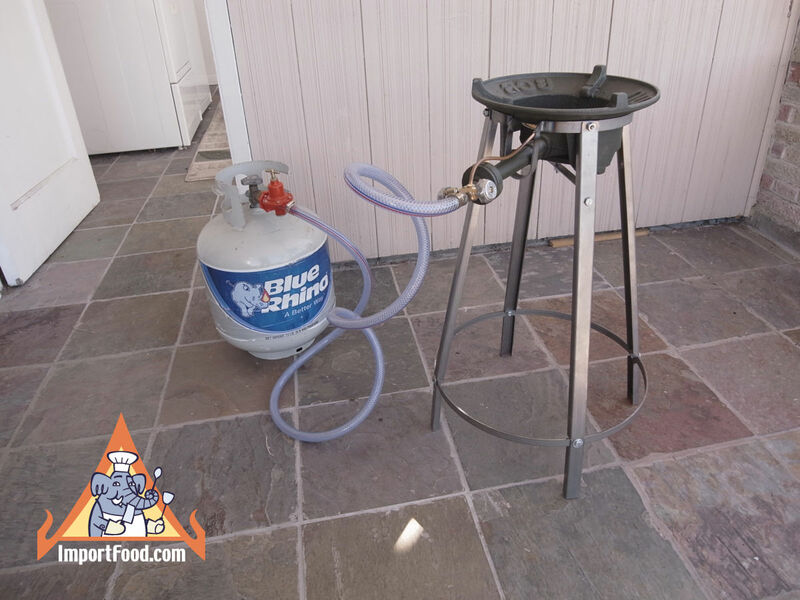 It works great connected to a propane tank, however you must understand that the fittings must be checked before each and every use. The burner must be disconnected from tank after each use. 1. 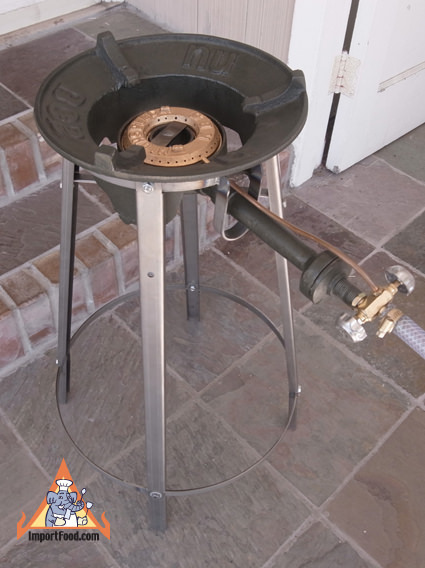 Once you are satisfied that everything is tight and not leaking (see above "BEFORE EVERY USE"), turn on burner valve (left knob) and light it. Leave the pilot light (right knob) off. Use a stove striker of some sort, or anything else that keeps your hand well back of the burner. This can make a lot of heat really fast. 2. 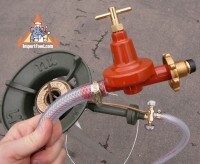 Adjust the green air valve until you have the maximum flame that is all or mostly blue. 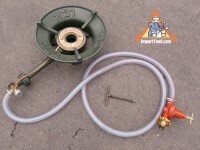 The red regulator is pre-set, but you can adjust it a bit to get the preferred flame. 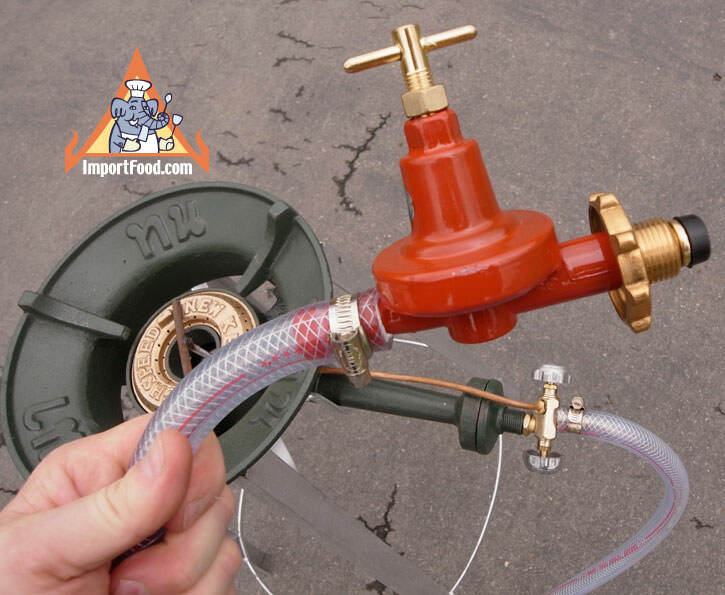 Use the set nut to keep the regulator at that setting and don't adjust it any more. 3. Cook away. Remember that this is like four or five of the "high output" burners on a "professional" stove; it is really hot and needs appropriate precaution. 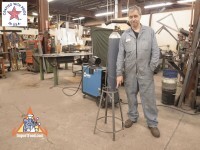 Keep it well back of anything flammable, and use high-test oven mitts when working with it. 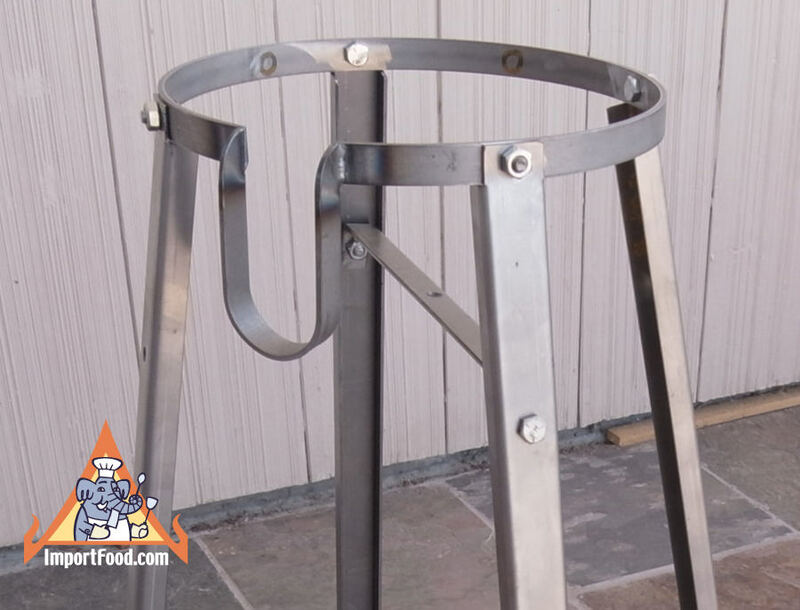 Make sure that all four legs of the stand are on something solid, and that your wok or pot fits well. 4. When done, turn it off at the tank. Don't mess with the regulator. 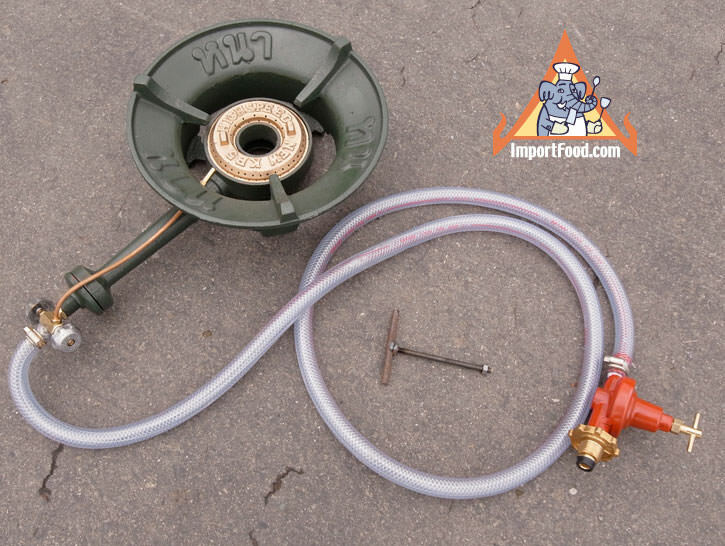 When the flame stops, close the valve at the burner, tighten up the green air valve, then disconnect hose from tank and store them until next time. 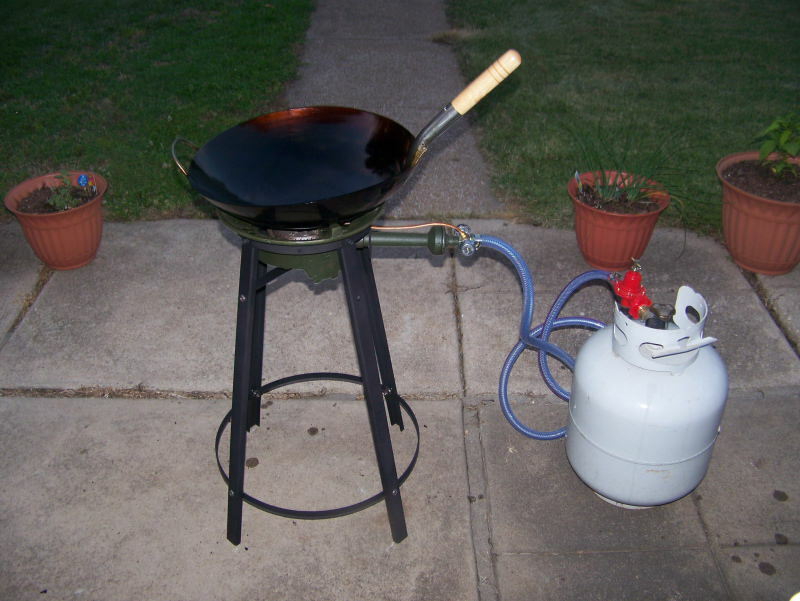 CAUTION: this is strictly an outdoors cooker. Blue flame=good, yellow flame=bad.